Weiss Lake is the first of six impoundments on Alabama’s Coosa River System. Its headwaters (the origin of the Coosa River System) begin in the northwest section of Georgia. The lower portion of Weiss Lake has two dams. Weiss Lake dam and the lakes power pool dam both drain the lake into Neely Henry Lake downstream. Weiss Lake is a huge, 30,200 acre lake with over 447 miles of shoreline. From the lakes headwaters at the Georgia state line to Weiss Lake dam is 34 nautical miles. The lake is 47 years old. Anglers visiting Weiss lake have three species of bass to target. 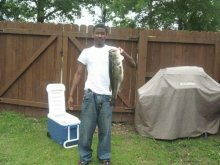 Largemouth bass, many of which weigh over 10 pounds have been taken in recent years. 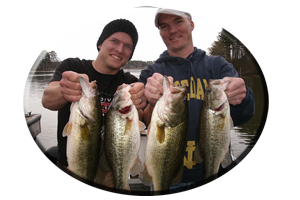 It is not uncommon in the spring to see it take 5 bass weighing over 20 pounds to win any major bass tournament. 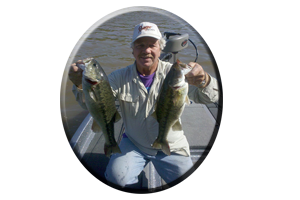 Weiss Lake also has a good population of Coosa River spotted bass, a fighting adversary in any anglers book. Striped bass, many weighing in excess of 30 pounds have been taken on Weiss Lake recently. Weiss Lake is also herald as the ” Crappie Capitol of the World,” and most anglers will agree after a trip to the lake to sample some of its fine paper mouth crappie. Some crappie weighing over 4 pounds have been taken in recent years. Drought this past summer season showed Weiss Lake displaying lower lake levels than ever been in summer’s past. This low water lake level has now existed since late spring, drastically slowing the lakes aquatic weed growth, some weeds of which just withered and died in the 100 degree hot, summer sun. Even during the fall season very little rain showed the lake still down several feet and little or no weed growth. Like any Alabama lake that displays lower than normal lake levels, navigation can be very hazardous for boaters. With the lake currently down 5 feet extreme caution should be exercised especially when navigating away from the well marked river channel or the lakes many creek channels. The lake has a lot of stumps left here during impoundment, including other wood debris such as laying trees or floating logs. It also has rock piles, most of which are normally submerged during full pool, but now visible or a boating hazard, just beneath the waters surface. Traditionally, during the winter season most anglers targeting the lake’s largemouth and spotted bass species avoid fishing the lakes headwaters. With good reason too. The lakes headwaters can display clear to lightly stained water clarity one day and be downright muddy, often just a few days later following winter’s heavy rains. Current is increased in these narrow, lake headwaters and winter’s very cold days and nights can drop the water temperatures into the 40′s. Cold, muddy water is the worst condition an angler can face during the winter months. Again, there is boat navigation. There have been many boats damaged and lower units on outboard motors destroyed by inexperienced anglers attempting to navigate these lake headwaters during low water conditions. So to avoid these mishaps and many other problems associated with fishing or navigating Weiss lakes headwaters, most anglers just stick with fishing and learning to navigate the boat in the lakes mid to lower portion. Fishing Weiss lakes mid to lower section during the winter months involves many tactics, various types of lures, precise lure presentations and having plenty of fishing holes located near deep water. Spring creek and Cowan creek, both of which are situated in Yancey’s bend just above the Hwy. 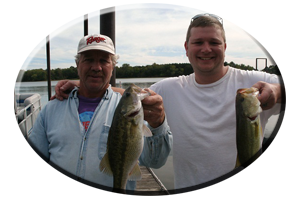 68 causeway crossing are good places to target throughout the winter months for both largemouth bass and spotted bass. The mouths of both of these creeks have deep water drop-offs, the points leading into these creeks are lined with stumps and this area in a main river channel bend always displays plenty of washed in wood debris. There are resident planted brush piles under piers, out in front of piers and along creek flats and main lake flats, all of which are now visible with the lake down 5 feet for winter pool. Stained water in this portion of the lake heats up faster than the much clearer water found downstream. This means much more active bass in shallow water during the midday to late evening period. Just below the Hwy. 68 crossing at mid lake there are two rivers that feed Weiss lake. Both of these rivers are a main influx of incoming waters, but these are two totally different feeder rivers during the winter months. If your looking for big, largemouth bass, generally stained water conditions, plenty of wood cover and warmer water during the winter months – then the Chattooga River may be your choice. The mouth of the Chattooga River joins the Little River on the main lake near massive, Hog Island. Then the Chattooga River twists and turns along a marked main channel bordering a river flat, before it narrows down, flowing under a new Hwy. 68 bridge lined with rip-rap rocks. This bridge is another portion of Hwy 68 coming north out of the nearby town of Cedar Bluff. From this Hwy. 68 bridge crossing keeping the boat at idle speed and your motor trimmed up is highly suggested. Study your map and proceed with caution. From here on up in the Chattooga River (that runs another 3-4 miles with a twisting and turning river channel), are still good, wintertime depths of 10 feet deep or deeper. Some deep winter holes, even with the lake down 5 feet, can often show more than one big bass taking up residence here for winter. You will see marked, PVC poles, wooden stakes or even steel re-barb protruding from the waters surface, showing marked underwater stumps and river channel edges. There are also deep outside river bends, and plenty of wood cover such as laying logs, log jams, trees and resident planted brush piles for anglers to probe for largemouth bass all throughout the winter season. Another main lake feeder at mid lake is the Little River. It is totally different than the shallow, wood laden waters of the Chattooga River. For one thing, its water clarity. With this past summer’s drought, not much rain during the fall season, and then little rain during the early winter months, this portion of the lake has become quite clear. Besides normally, clear water conditions during the winter months, the Little River is a cool, flowing river generally displaying colder water than the incoming Chattooga River or the main lake itself. 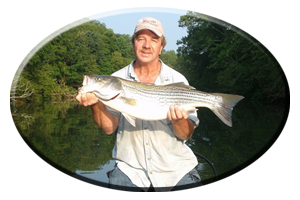 But these can be good, wintertime conditions for anglers seeking those trophy sized spotted bass and some big, striped bass. The Little River joins the Chattooga River just behind Hog Island. Navigating a marked river channel, you will see a twisting and turning Little River channel that lines a rocky, bluff type bank. From here on up another mile or so is a stump lined flat with laying logs, trees and stumps and a few piers close to deep water. Rock bluffs are clearly visible (as you idle your boat) in the far back end of the Little River flats. These bluffs are the last deep water in the Little River area during low winter pool. Besides the lake’s headwaters, incoming feeder creeks and these two feeder rivers… there are still plenty more places for bass anglers to explore on the Weiss Lake this winter season. But always keep in mind, even with the lakes deepest water available on the lower lake region, navigating the boat with caution is advised. Rip-rap rocks are found all along Weiss Lakes main lake bridges, its many rock lined causeways and all along the lakes lower dams. These rocks heat up during the sunny, winter days and they can hold bass of all species all throughout the winter months. The lakes power pool is like a small lake all in itself. 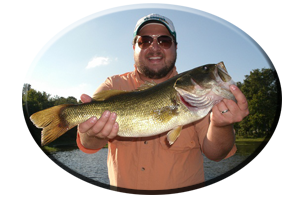 During winter warming trends, several consecutive warm days and nights can show this water heat up fast, creating some fast, but short time wintertime bass action.